A new baby brings new adventures and even if you’ve been a parent before, each milestone in your baby’s life is exciting and unique. One milestone I’ve always looked forward to is the solid feeding stage. 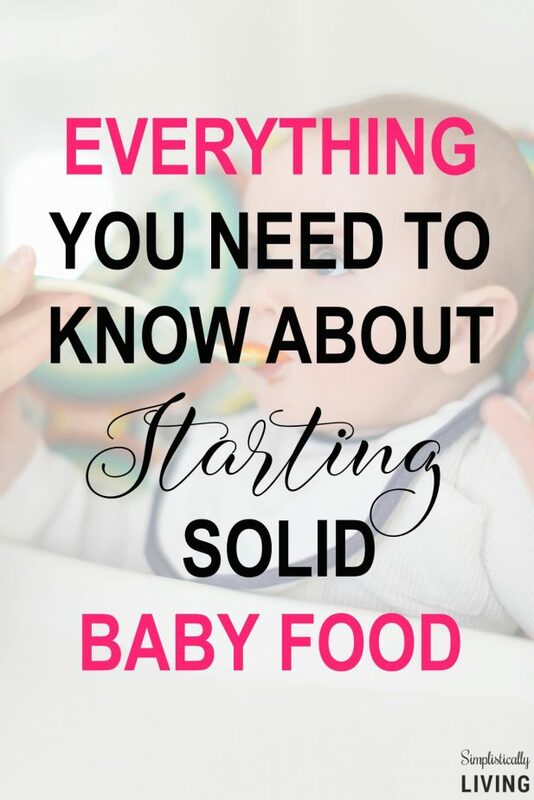 If you’re nearing this stage (or just want to be prepared) here is Everything You Need to Know About Starting Solid Baby Food. Starting solid baby food is an exciting time in your baby’s life. I like to think of it as the first sign of independence. This is a time when you get to introduce your baby to new foods and watch them enjoy the taste of something else besides milk or formula for the first time. Think about it, anytime you’ve ever tried something new for the first time, it was exciting and a rush at first even if you didn’t end up liking it in the end. Imagine how that feels for your baby. With all of that in mind, let’s get to talking about what you need to know when starting solid baby food and answer those burning questions you may have. When should I start introducing solid baby food? Knowing the signs of when your baby is ready for solid food is important as you never want to introduce solid foods too early. If your baby is of age and showing those signs, it may be a good time to start introducing solid baby food. What solid baby food should I start with? I remember when I had my first baby and it came time to start solid baby food, my biggest fear was not knowing what to start with. I knew it had to be easy to digest and items that were less likely to cause choking or an allergic reaction especially since food allergies run in our family. 4-8 months: single-grain cereals and pureed veggies, fruits, and meats. Things like cooked baby cereal and solid baby food. 6-8 months: single-ingredient finger foods that are easy to smash. Think of things like mashed potatoes or green peas. 9-12 months: chopped, ground or mashed foods. Things like rice and very small pieces of ground meat. What baby food brand is the best to start with? 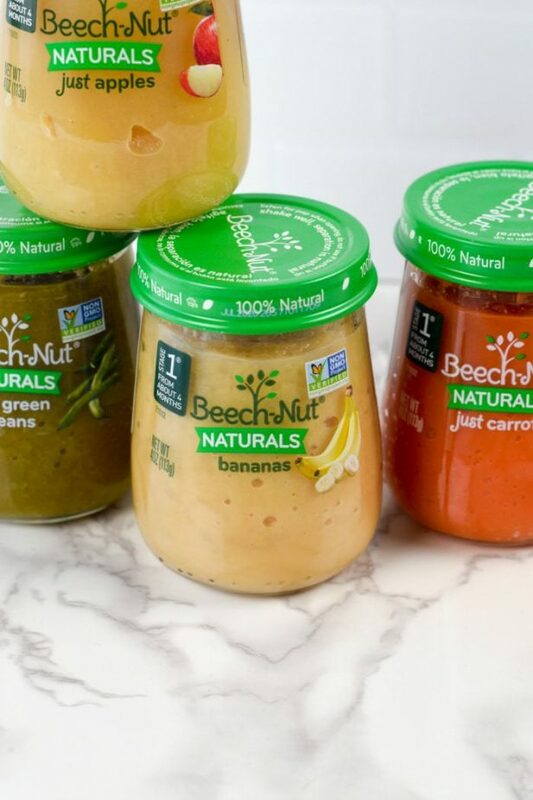 Beech-Nut® Naturals™ is inspired by homemade and is real food for babies. When I say “real food” I mean their baby food is made with real fruits and vegetables, just like you would use at home. 100% natural, nothing artificial and contains ingredients you can read and pronounce. I don’t know about you, but knowing that my baby’s food is natural and doesn’t contain a bunch of added artificial fillers makes me feel like I am making the right choice for my baby. 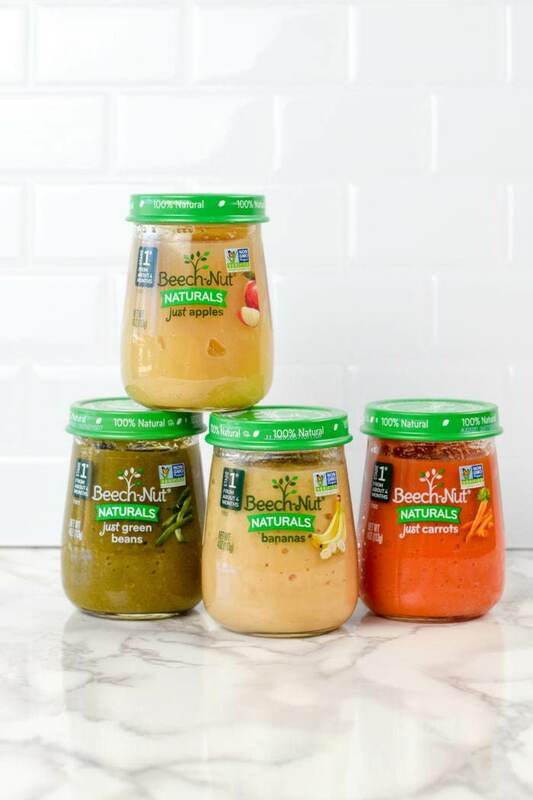 The other thing I love about Beech-Nut® Naturals™ is they make choosing baby food easy. For example, stage 1 is from about 4 months of age and contains single ingredient solid food so you don’t have to wonder what is in it. Stage 2 is from about 6 months and contains two or more food ingredients. Both make choosing baby food easy! You can find Beech-Nut® Naturals™ at your local grocery store or use the online store finder to find them near you. Should I continue feeding my baby breastmilk or formula? The quick answer to this is yes. Your baby still needs the nutrition provided from the breastmilk or formula until 1 year of age when they can transition to whole milk. Solid foods up to 1 year of age are more to get your baby introduced to new foods and textures rather than be meal replacements so keep this in mind for feedings. I briefly touched on the allergy and choking aspect of introducing new foods to your baby and while that is a cause for concern and can be scary, knowing the common allergens and common foods that can cause choking is going to be a good place to start. Also, avoid anything you know may run in your family as an allergen. My son ended up being allergic to peanuts which is not only a very common allergen, but also runs in our family as being an allergy. As always, when in doubt ask your pediatrician. 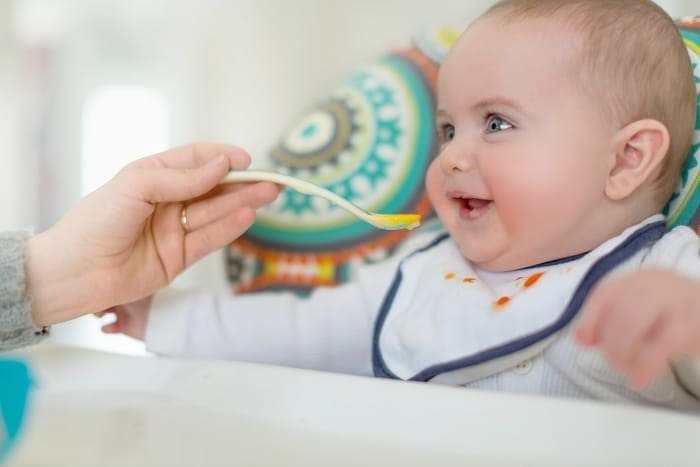 Starting your baby on solid food is an exciting time and knowing exactly what, how and when to feed them is the best way to ensure a successful introduction to new foods. Disclosure: I was compensated by Beech-Nut® for this post. However, the opinions expressed remain my own.